“I can resist anything but temptation!” says the bumper sticker. It’s funny, but as with so many things, one of the reasons it is funny is because sometimes it is all too true. As Christians, we know that temptation toward sinful, illegal or destructive things needs to be resisted, and yet we often find ourselves losing the battle. That is not only frustrating, it can get downright depressing. It can even make us start to question whether God still loves and cares about us. The fact that Jesus was tempted in all points like as we are (Hebrews 4:15), teaches us at least two things. One thing it teaches us is that just as Jesus overcame every temptation, so we need to follow his example and make every effort not to fall to temptation either. But there is so much more here, and it makes all the difference. If Jesus were merely a great role model that we should follow, there would be no hope for us. Following Jesus would then just be another of the world’s many religions — humanly devised systems of coping with bad behavior and plagued consciences. The other thing these temptation passages teach us is that Jesus overcame every temptation in our place, as one of us, both representing us and substituting for us before God. Notice where Hebrews 4 places the emphasis: First, Jesus is presented as an incomparable High Priest (v. 14). The job of a high priest is to mediate on behalf of the people toward God. He offers the sacrifices and acts as the go-between to get everything straightened out between sinning people and God. In religion, this concept keeps people mindful of the need to behave better and establishes a hierarchy of humans that can exercise control over the masses. But the gospel is not another religion. The gospel tells us that the real and true High Priest is God himself, the Second Person of the triune God — the one who became Jesus Christ. He died and rose from the dead in glory, and now is in heaven as a glorified man and the Son of God at once, making actual peace between sinning humans and God. Jesus did not sin; he took all the sin of humanity onto his own head. But all the sin in the world was no match for the Son of God. In him, sin, all sin, found its demise. In Christ, God destroyed the work of the devil and defeated sin — our sin — once and for all. This is not religion; it is the gospel. That is why Hebrews 4 emphasizes the truth that Jesus sympathizes with us in our weaknesses, and the truth that because of Jesus doing what he did regarding sin, we can come with boldness to the throne of grace to receive mercy and find grace to help in time of need. We find the same emphasis in Hebrews 2:17-18. He became like us humans in every respect for the express purpose of being a merciful and faithful high priest in the service of God. He can help those who are being tested because he was tested like they are. How does he help them? By his sacrifice of atonement (restoration to fellowship with God) and by being merciful (he forgives you) and faithful (he’ll do it every time). Look how verse 14 puts it: “For we have become partners of Christ, if only we hold our first confidence firm to the end” (NRSV). In other words, trust him. Trust him to do what he says he does for you — forgives you. Trust him to be what he says he is for you — faithful. Trust him to know what he’s doing. Trust him to love you the way he says he loves you. Trust him to be the Creator and the Redeemer of his Creation that he claims to be. How can you lose out on such a great salvation? The same way you would lose out on a million dollars if you got a letter from the bank telling you someone had put it in your account, but you didn’t believe the bank and never went to take it out — by not believing. By not trusting the giver of the gift. By not trusting God to love you and forgive you and transform you and make you his own child like he tells you he has already done (Ephesians 2:4-6; Colossians 1:13-14, 22; 2:13; 1 John 3:2). The gospel really is good news! Trouble is, for many of us, it seems too good to be true. We want to have at least a short list of “do’s and don’ts” to separate the wheat from the chaff. But God gave us no list. He gave us himself. In Christ, we have everything we need for salvation. He saves us; not Hail Marys or holy days or verbose prayers or even great worship music and perfect doctrinal understanding. We’re not worth saving because we convince him we are; we’re worth saving because he decided we are and did it. We devote ourselves to love and good works and righteous living because Christ has given us a new mind and heart, not because we figured out by intensive study that “we’d better or else.” And even so, we fall to temptation far more often than we wish we would. But in spite of our failures, it is Christ who saves, so who will bring a charge against us? Paul figured nobody could — and make it stick, that is — because nothing “in all creation, will be able to separate us from the love of God that is in Christ Jesus our Lord” (Romans 8:39). So, why bring a charge against yourself? The only thing charging yourself can do is erode your trust in Christ to be the Forgiver and Grace-giver that he says he is for you. Consider Jesus’ temptation. First, the Spirit drove him into the desert. That reminds us that Father, Son and Holy Spirit are one God with one purpose for us, and that purpose is the redemption of the entire creation. Why the wilderness? Because the wilderness is the barren habitation of lizards, snakes, scorpions, barbed plants, buzzards and such like. It is representative of the world of sin, the world of the devil, the world of lies, deception and death. It was there, on the devil’s own turf, so to speak, that Jesus encountered the devil and defanged his power to overpower humanity. 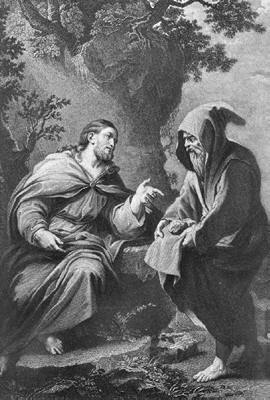 Jesus was at his weakest, physically speaking, after 40 days without food, but even at his weakest, he made short work of the devil’s best stuff—satisfaction of physical appetites (“turn these stones into bread”), power, wealth and influence (“rule all the kingdoms of the world”), and self-indulgent arrogance (“show how important you are by jumping off the temple wall and making the angels catch you”). When it was over, the angels waited on him. He ate a legitimate meal, provided from the Father by the angels, not a meal the devil offered. And all this was only the starting point of his long journey to Jerusalem to be murdered, buried and resurrected to glory — as one of us for all of us. What more could we ask? The very God we are afraid doesn’t like us, is fed up with us and won’t forgive us again, is the God who loved us so much that he sent his Son, not to condemn the world, but to save the world (John 3:16-17). In Christ, God has done for us what we could never do for ourselves. He has taken our sins on himself, forgiven us, reconciled us with himself and made us a new creation in Christ—redeemed, healed in mind, spirit and body and perfectly unified with him. Though we do not yet see what he has made us to be in Christ, we can trust his word that at his appearing, we will be like him (1 John 3:2). In our own temptations, then, we can take heart. Christ is with us, drawing us to him and away from sin, but when we do sin, we have an advocate with the Father, Jesus Christ, the Righteous One, who not only set the example for us, but also made atonement for the sins of the whole world, including ours (1 John 2:1-2). Trust him. He did it for you!